We have just discovered a new MTN free browsing cheat called “MTN Hammer VPN cheat” capped around 150mb per day but here you will find solution on how to bypass this daily data limit. MTN Hammer VPN cheat can be unlimited once the daily data limit is bypassed but you need to know why and how to achieve this. This is why I’m taken my time to explain and introduce this latest free browsing cheat today. 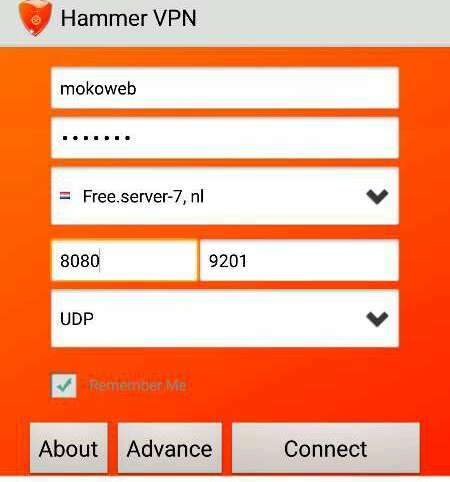 Hammer VPN is a useful VPN app with inbuilt free and premium servers. The good news is this servers now works on MTN so that users will use it and enjoy free browsing before it gets blocked. The original version of Hammer VPN doesn’t work in Nigeria and some other African countries because it’s basically developed for USA, Canada, England, Belgium, Australia, Germany, Turkey, Singapore, Greece, Italy, Dubai, France etc. But don’t worry, we are using the modded version of Hammer VPN that works for Nigeria, Kenya, South Africa, Ghana, Philippines, Indonesia and other countries. This simply means that this modified edition is available for all nations of the work. There is no limit to the number of servers you can hook to if you are a premium user of this app. How Many Data Volume Will I Get Per Day? Unlimited? If you are using the free servers, you will be limited to just 100mb or 150mb per day on each server. However, some few users has revealed that they were able to use up to 500mb per day by switching to different free servers but personally, I got just 150mb per day on the free server. Meanwhile, to get unlimited access and bypass the daily data limits, you must be a premium user. I explained how to get premium servers later on this article. First things first, download the hammer VPN app from the link above, then apply below settings. Now connect and wait for few seconds for the connection to establish. After that, you can minimize the app and launch your favorite app or browser to enjoy free browsing. Note that it powers al apps on your phone so it’s enough downloading and streaming as well as chatting. Hammer VPN has both FREE and PREMIUM servers. Free server are capped at around 150Mb per day while Premium servers are unlimited. Therefore, to enjoy the unlimited connection without data cap, you need to subscribe for a Premium account. Okay let’s see how to get unlimited usage and access on Hammer VPN. Hammer VPN Mod – Download Here. Download ES File Explorer Here. You will be getting popup notification reminding you of the number of Sessions you have used on the server when using Hammer VPN app on your phone. You can get about 4 notifications on the number of Sessions used, but once you get the second or third session notification, you then have to apply this simple trick below. Launch ES file explorer you downloaded from the link above and click on the Menu icon which you can find at the top-left corner of the screen. Scroll down and enable Show Hidden Files. Now scroll up and click on Local, then click on SD Card. All the folders in your SD card will appear. Now, open the file and look out for this numbers 11-78217944. The first two numbers indicates today’s date. Now change it to the next date. For example, today’s date is 11. Change it to 12, then save and exit. Now return back Hammer VPN and connect again. You need to keep repeating this tricks on second or third session notification or whenever you are about to exhaust your daily limit. NOTE: Don’t completely exhaust your daily limit before applying this trick else it will not work and you have to wait till the next day. You can actually get more and more servers including Germany servers on Hammer VPN by applying below tricks. Now launch Hammer VPN app again while airplane mode is ON and select Germany server  and it will appear. Now choose your preferred Germany server and turn off your Airplane mode. Now, toggle on your data connection to establish connection. Congrats! You have successfully connected to the German server. Whether your phone is rooted or not rooted, you can use this cheat on PC using anyone of this apps to share VPN cheats on PC. I hope you can now enjoy this new MTN Hammer VPN Cheat 2019 on your Android and PC. Thanks for reading.